The Netherlands, and Amsterdam in particular is famous for its picturesque canals, beautiful (but badly dressed) women, international character and terrible, shocking, appallingly bad service, or as the Dutch call it ‘belabberde service’. With this in mind, the Shallow Man, staying true to his remit of educating, informing and entertaining, has decided to advise his Multikulti expat flock on how to respond to appalling Dutch service, in het Nederlands. Some of the Dutch phrases I’m about to teach you could be perceived as being rude, but the Shallow Man believes in telling it like it is. Big thanks to my Dutch teacher at Koentact for her assistance and patience, as always. Nee, dat kan (helaas) niet/ Dat is (helaas) niet mogelijk. I’m sure that somewhere in the Netherlands is a Dutch service training school for people that will work with the general public. There they learn that instead of helping customers, or attempting to find a solution to a problem, that the simple answer to use ALL the time is Nee, dat kan (helaas) niet/ Dat is (helaas) niet mogelijk. Give me a K, give me an L, give me a …. O, wat vervelend, kunt u mij uitleggen waarom niet? 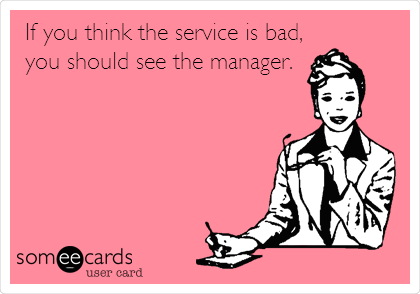 Of moet ik dat even vragen aan uw manager?/Oh how annoying, can you please explain why not or should I ask your manager instead? Don’t hold your breath that this will help as where there are poorly trained staff, then there are often also indifferent and disinterested managers. You can at least try. Another option, of course, is to simply (as I have done several times) just walk out of the establishment and spend your hard earned money elsewhere. Is there anything more annoying than when you’ve been sitting in a cafe for what feels like ages. You’ve watched other diners meet, become couples, breakup and get back together again while you’ve been waiting to be served. Finally, a waitress arrives, dying of thirst you reach out to her, like a drowning Dutch TV presenter grasping for a lifebelt. So some questions immediately spring to mind. When you arrive in a cafe, how in the name of Bob Marley are you supposed to know who should be serving your table? Is it really so difficult for the waitress to simply take your order and give it to the invisible person that’s supposed to be serving you? Jij: Oh wat jammer nou. Wat is precies je naam? –Pak je telefoon– Ik was net bezig op Yelp (=recensie website restaurants) jullie service een rating te geven en het is voor mijn verhaal wel leuk als ik er een naam bij heb. 3. When You Wait for Ages and You Haven’t Been given a Menu. Catholics, are taught that between heaven and hell is a place called purgatory, where you can wait for thousands of years prior to entering heaven. Well you can prepare yourself for the long wait in the afterlife by experiencing Dutch service in some restaurants. Optie 1: Je zegt tegen een ober: Krijgen we hier een menu of heb ik het concept verkeerd begrepen? (of course you didn’t misunderstand the concept. they’re just too slow). The Shallow Man once waited around in a PC Hooftstraat store while the two members of staff present discussed what a fabulous club they’d been to the night before. I knew that they were talking nonsense as Amsterdam has a distinct lack of fabulous clubs. Jij: Sorry dat ik jullie enorm interessante conversatie moet verstoren maar ik had even een vraagje. You: Sorry to interrupt your thrilling conversation but I have a question. 5. When They Close the Bloody till While You’ve Been Waiting in Line! I’ve had this happen to me. I was standing in line at BCC for ages, waiting to pay for some kind of gadget. There were only two tills open, and a long queue for both. Finally, like a dying man in a desert that sees an oasis (water not the band) in front of him, there was only one person ahead of me. This person paid, and then immediately afterward they closed the till! Just like that. No apology or acknowledgment of the well-dressed man that had patiently been waiting there. I was expected to get to the back of the adjacent queue! Jij: Geen probleem. Ik ga anders wel even naar de mediamarkt, die is tot 20.00 open. Toch wel jammer he? Dat de kleine electronicazaken tegenwoordig bijna allemaal failliet gaan. Dat ligt ongetwijfeld aan de crisis. Fijne dag nog! In Amsterdam, there’s no chance of ever being lonely, as there will always be mice paying you visits. They make friendly neighbors, popping in to borrow some cheese, or to take a look at your copy of the John Steinbeck novel ‘of Mice and Men.’ Having had enough of laying mouse traps in the apartment, and waking up to the sight of dead mice first thing in the morning, I decided to hire a pest control company. They claimed that they would block all of the access points where mice entered my humble abode. A lot of money was handed over to them, and for a week or two, I saw no evidence of mice. A couple of weeks later, I witnessed a mouse, attempting to exit my kitchen with a jar of peanut butter strapped to its back. I called the pest control company, and the next day had the same guy who’d botched the previous job return to explain how this was possible. With the eloquence of a graduate of the Royal Shakespeare Company he delivered a long monolog about how mice are incredibly resourceful and creative and are constantly developing new techniques to enter apartments. He then had the cheek to ask for some more money. Jij: O wat naar! Weet je wat die vervelende muizen ook hebben gedaan? Ze hebben jullie facturen opgegeten. Ik kan je dus helaas geen vergoeding bieden voor deze uitermate goede service. The Ziggo support staff are often thicker than Yolantha Cabau’s collagen stuffed lips. Was je altijd al zo slecht in je werk, of heb je daar een speciale cursus voor gevolgd? -Using diminutives ‘noun+(t)je’. Zou u heel misschien een stapje opzij kunnen doen? -Use: O wat+vervelend/jammer/naar. O wat jammer dat u niet op de tweede verdieping bezorgt. De gouden tip is eigenlijk dat je slechte service niet moet accepteren door het te vermijden. Bijvoorbeeld wat betreft de horeca is er ook onder Amsterdammers veel onvrede over de belabberde service (in het Parool is er zelfs een wekelijkse rubriek aan gewijd). Doordat het steeds meer een topic wordt, is in Amsterdam het aantal plekken waar het personeel streng gescreend wordt gestegen (voorbeeld: de Biertuin, Bukowski, Smoking Barrels, de Waterkant). Wil je zeker zijn van een goede service van wat dan ook, check recensies op internet, luister naar tips van vrienden en blijf altijd lachen. Dan overleef je het wel! Succes! Remember that the Internet is no friend of places that provide bad service. 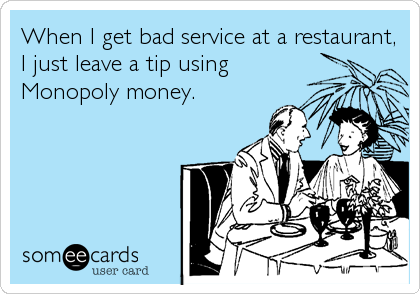 Get on Yelp, IENS and other review sites and make damn sure that you tell others when you receive poor service. 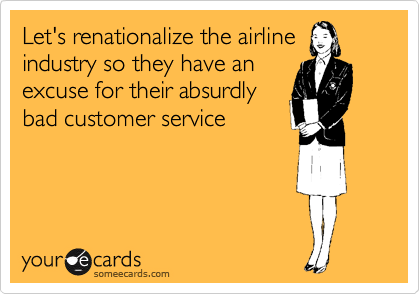 On a positive note, I will add that the Shallow Man has seen some improvement in Dutch service in recent years, so slowly things are changing. A huge thank you to Koentact for their assistance with this post. No Shakespearean pest controllers were hurt during the writing of this post. Until next time, hou je kop!